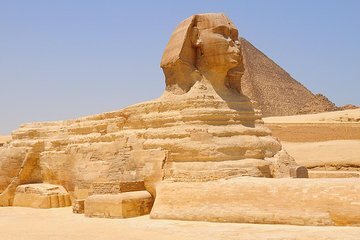 Gain fascinating insight into the Ancient Egyptian empire on a private full-day tour of Giza, Saqqara and the Egyptian Museum from Cairo. Travel in a comfortable, air-conditioned car to Saqqara and marvel at the iconic shapes of the Great Pyramid of Giza and the Pyramid of Userkaf. Behold the enigmatic Sphinx at the Valley Temple; browse the fascinating exhibits inside of the iconic Egyptian Museum, home to Tutankhamen’s resplendent death mask; and enjoy a typical Egyptian lunch in a local restaurant. Receive personalized attention from your expert guide on this private tour.